Cloud server hosting is a field that is, well, a bit nebulous, as expressed in the below comic. The cloud can be instrumental, though, for web prominence. Whether a company is doing its own SEO and marketing or using an outside service for those purposes, cloud computing can play an important role in the success of campaigns. Of course, we understand that the Internet is not a physical object. However, we have gotten used to the idea that websites are stored on individual servers. Get dedicated hosting, and you have your own server. Get shared hosting, and you share a server with lots of people. Get VPS hosting, and you share, but your section functions as its own server. Cloud server hosting, however, removes storage of your website from a specific physical space. Instead, your site is stored throughout a server cluster designed by the hosting company. Rather than talking about one server or a piece of a server or multiple dedicated servers, you have a group of computers all storing and delivering your website. It’s efficient, affordable, and scalable. A major advantage of the cloud, for delivery of content, is that you are not tied to one location. Understanding the way that search engine rankings and geographical location relate to a sense of why this gets complex for SEO. The reason location of the server is important to your ranking on the search engines is that services like Google use a person’s physical location in the world to determine results. That’s one way that the search engine’s try to make results more relevant to the user. Forgetting servers and just considering content, it’s the reason why you can enter “order sushi” into search in Albuquerque, and many of the top results will be from your local area. Search engines don’t just look at where the user is located, though. Google and Bing also check the IP address of the server delivering the site to determine physical hosting location. Regardless of the top level domain (TLD) – such as .com or.uk – your site will show up in searches for that country. TLD’s are by no means irrelevant to SEO. The location of the server is not as crucial for a site with a local TLD (such as .com.au in Australia) as it is for generic top-level domains (such as .org). However, it’s also possible within Webmaster Tools to specify a site’s location, at least for Google. It has made sense in the past to have your server located in the nation where you most want to do business; this practice lowers latency for you and your users (the interval between sending a request to a server and receiving a response), and the search engines like that. when a site and a server are in different geographical locations (a key component of the worldwide nature of cloud computing), Google does not allow the site as much geographical specificity. Regarding the first of those two issues, when your site competes, over time, the version with the most authority will get better positioning on the SERPs (search engine result pages) than the local site. For example, a site that has both a UK and an AU version competes against itself. Even if the AU version is intended for Australians, the UK one could get better rankings based on the confusion created by cloud hosting. Regardless of these two ways in which the search engines need to improve, significant emphasis is placed by Google and Bing on page load speed. It first became a recognized optimizer in Google Caffeine, which also created a much more sophisticated site indexing system. That’s good news for those using the cloud. The nature of cloud infrastructure makes it much easier to deliver a webpage quickly. A faster site means better search rankings. More than anything, it’s illuminating to get a sense of Google’s perspective toward the cloud. It’s certainly not dismissive. Matt Cutts, head of webspam at Google, wrote a post on his site in 2008 entitled, “Why cloud services rock.” The following year, he spoke in a video about how cloud storage is positive for search. 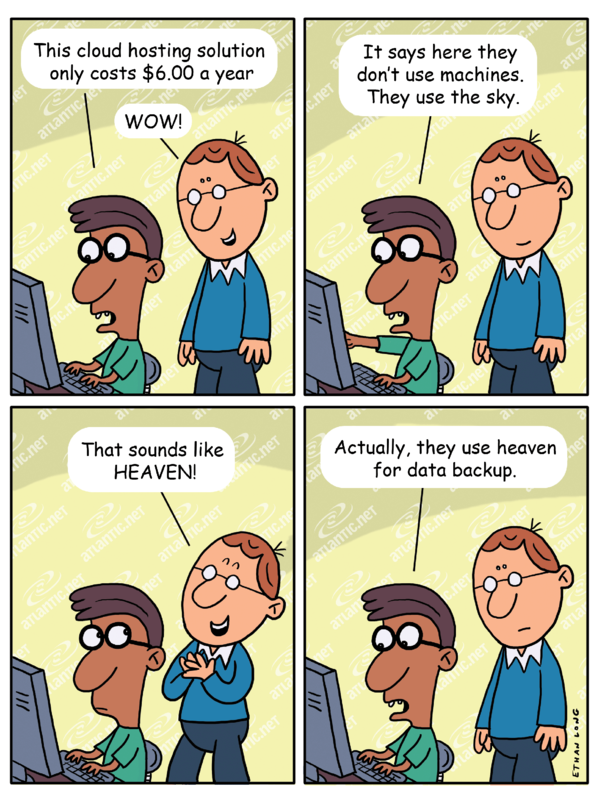 Again – as seen in the above comic – cloud server hosting can be all over the place. Much of the reason why the quality of a given cloud system is difficult to determine is because of the strengths of the cloud: its diversification and lack of physical specificity are exactly what makes it more flexible, scalable, reliable, and affordable. If you want real, dependable, secure cloud server hosting solutions, we’ve got you covered. We also offer managed and HIPAA compliant WordPress hosting solutions.